Kapadia figures that in reality the only way they will truly franchise him is if they already have a deal in place. They aren't going to take a lousy offer just to keep him from signing with a division rival, and if they actually franchise him they lose all leverage, since they can't keep him. He predicts Foles still ends up being a free agent. 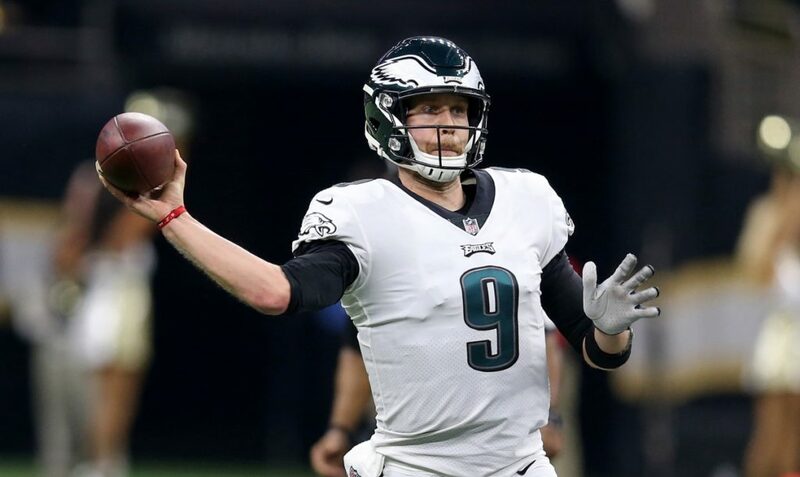 According to an ESPN report on Saturday, the Eagles are willing to use the franchise tag on Nick Foles. Sheil Kapadia explains why Howie Roseman is likely bluffing and why a trade is still unlikely. I am unable to read the article but that is an interesting take. At one time, I heard they had a deal in place with Jacksonville. That appears to have gone quiet. Don't we get a 3rd round pick if he leaves via free agency? The compensation formula varies (and I believe depends on a team's total amount of free agent activity in both directions) but the main thing is any team's third-round pick would be higher than a compensatory third-round pick. Greatly so if it's a bad team. it would also possibly move the pick up a year vs waiting for the comp pick next year, which some people value pretty highly when you are talking a third pick.. For instance, we are getting comp picks for losing Burton, Beau Allen and Robinson this year. Of course, if it is a bad team, I'm sure they will want to push the pick out to 2020 also in hopes of Foles' impacting their draft position before paying up. Either way I would be surprised if the Eagles could get a three for what is really just a first look benefit. I'm not sure they have to worry about Foles' play affecting the pick. It's more about whether they want the pick in 2019 (i.e, to replace the Tate pick) vs. 2020. But yeah - they are fishing for that third. His value has not increased, in context, because any team can still get him as a free agent unless the Eagles can fool someone into thinking they have to give up a third to keep him off the open market. And that team not only has to give up the third, they have to be willing to take on the franchise tag salary. Some team even spend years developing a QB to be able to do what Foles does. So, I think he's worth more than a 3rd round pick. He would be worth a first round pick if you could have him for four years, as with a draft pick. Or if there was any chance at all that he won't just be a free agent. Right now all the third-round picks gets you is something you might be able to have for nothing, and under a long-term contract to boot. The only reason to give that up is if you don't think you are a team he would sign with on the open market, and if that's true do you really want to give up a draft pick and $25 million to try and change his mind? If if it's really true that his value is even higher now than it was a week ago he has no reason to pass up the open market. If he is franchised and traded can that contract even be renegotiated or is he locked into the terms of the franchise tag until next year? If franchised he can still negotiate a long term deal until about mid-July. If no deal by then he has to play under the franchise tag. But realistically it all has to come together during a one week period in early March. He would have to be franchised around March 4 and the new contract year starts March 13 and that is when he would have to be be off the Eagles books or else all heck would have to be restructured\players retired. One of the arguments I have seen against giving Foles the Franchise Tag is that if he walks we would end up with a 3rd round pick anyway. My question is, since Foles has only been a part time player the last 2 years is that really correct? Yes, I know he has obviously been successful, but he hasnt put up "counting" numbers, just quality games. I wonder how the equation treats that, my guess is that the counting numbers are more important. Now it could be that Super Bowl MVP is in the equation, in which case obviously he gets a big lift. Giving Foles the Franchise Tag is a huge risk. We could get stuck with him at $25M, which would be a complete and utter disaster. I wonder if the Eagles dont try to make some kind of back handed deal with Foles not to sign the Tag until a trade is virtually certain, but what would Foles' get out of it? We are in a weird spot. If the team knew they were getting a 3rd round pick for letting him walk then honestly that might be the best choice, but I suspect that it isnt clear, or even likely, that is the compensation. Free agent compensation for UFAs that leave is based solely on the contract the player receives in free agency. The picks are awarded in the subsequent draft. Thus the Eagles would (possibly) receive a pick in the 2020 draft for Foles leaving. However, it depends initially on whether the Eagles sign more UFAs than they lose. Free agent compensation for UFAs that leave is based solely on the contract the player receives in free agency. Yes, I forgot that, it was changed. There used to be a "formula" but it was changed to size of the contract. Thanks Squire. They don't know what the pick will be, it's just speculative (but yeah, safe to say he will get a big enough deal). But there is zero chance they actually tag him unless a trade has already been agreed to, even if it's a half-hour before the deadline. One of the reasons the Eagles may tag Foles is to ensure they get maximum value for all of their free agents. While the formula is out there for free agents, the amount of comp picks is capped at 4 picks. Right now the Eagles have 5 or 6 players who would be comp pick worthy, Foles, Graham, Tate, Darby, Hicks and Ayaji. I don't think they will bring any of them back.So franchising Foles and trading him even if its for a 4th or 5th rounder allows them to get compensation for five of their players. Even if they deal Foles straight up for a player like it still has them ahead of the curve. Ooh, interesting observation. I still don't think they will actually tag him w/o a deal in place, there just aren't enough buyers (who need a QB, can afford the franchise tag salary, and are willing to just have him for one year) to assume you could always trade him on the cheap afterwards. He will be released if nobody makes them an offer, but what you are saying is it doesn't have to even be a third-rounder. But... isn't the formula also based on how many UFAs you sign? So even if they lost 6 they are probably going to sign 2. Or is that not right? Yes, it is the net of losses vs signings, capped at 4 per team and 32 overall league-wide. The following is from the NFL.com site, but not the collective bargaining agreement, just an analysis projecting the 2019 picks which teams will be awarded. "So, how do compensatory picks work? The number of compensatory picks allotted each year is limited to the number of teams in the league (32), per the Collective Bargaining Agreement. However, compensatory picks are not divvied up equally among the teams and no team can receive more than 4 compensatory picks in a single year. To qualify for compensatory picks, teams must end up with more or better compensatory free agents lost than gained in a particular year." So I would tend to agree that if the Eagles lost the six players noted above I would expect at least 2"solid" reverse signings. Also, I would not be opposed to bringing Ajayi or Darby back on one year "prove it" contracts, assuming neither are able to get solid multi-year deals elsewhere. They may feel that "proving" their value would be easier within a system that they are familiar with that doing it elsewhere on a one year deal. I guess we are all Harper all the time right now but Eagles said they won't use the tag on Foles. I guess that could be one last tactic to solicit an offer but Rosenman specifically seems to be saying they want to let Foles pick his next team. May cost Eagles some talent ad they given him franchise tag and traded him. But if I were an NFL player looking for a team to sign with,I'd remember the Eagles treated Foles right. It does get us back under the salary cap. Tagging Foles would have been a huge risk, it was one thing for the Phils to get stuck with Millwood all those years ago, but this would have been a big part of the salary cap for a guy you hoped didnt play. It was also going to be hard to trade Foles with the tag attached, as the salary would be prohibitive. This way we just hope he signs a big contract and we get a pick out of it. Rumors that the Giants are very interested in Foles. I really wouldn't like to see that happen.